Last month, a number of people sent me a link to a site with a “dyslexia simulation” that was supposed to mimic the experience of reading for dyslexics. The page was set up as a Wikipedia article where most of the letters within words were rapidly switching. It was definitely visually overwhelming. Several people commented to me that they felt they had a greater understanding of how difficult reading is for dyslexics after visiting the site. 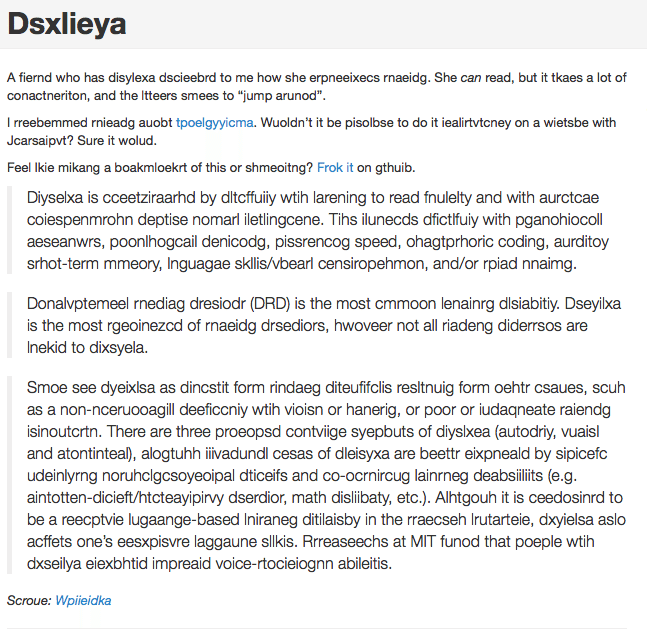 While I appreciate the intention of the simulation, and certainly love a chance to discuss the facts of dyslexia and other learning disabilities, I was frustrated by the site. Their representation of dyslexia is misleading at best, and is unsupported by current research on dyslexia. The International Dyslexia Association published a column by a social media editor with dyslexia, explaining why the simulation doesn’t represent the dyslexic experience. We encourage you to check it out! Let us know your thoughts – what was your opinion of the simulation?